Smoking is a very personal issue for me. My grandmother, easily the most kind-hearted woman I’ve ever met, lost her life several decades too early as a result of lung cancer, thanks to second-hand smoke. It was at that time, when I was still very young, that I decided I would do what I could to protect those around me from smoke. Like many, I grew up around a number of smokers. My mom smoked while I was young but made the right decision to stop after she saw how it was affecting me and my brother. She was also smart enough to smoke outside, or at least primarily so, unlike the situation many children are trapped in. This is where my fury kicks in. Bad Customer Service? Don’t Take No for an Answer! It seems that everyone, except the customer service providers themselves, knows that customer service is terrible these days. Cable companies, telecom monopolies and consumer electronic companies have the worst customer service but the problem exists for the majority of consumer-facing businesses. So what can you do about bad customer service? For starters, don’t take no for an answer! Determine whether or not the fight is worth it. You will certainly cost yourself some time so make sure you are fighting for something more than $5. Fighting on principle may be acceptable. Determine your “leverage” or the amount you were “harmed”. The more arguments you have the better your chances of getting what you want. Only one legitimate argument should be necessary to win. Explain your situation to the agent in a clear and concise manner, outlining your arguments. Wait for them to offer you something and if they do not, make a specific request (1 month free, a refund etc.) Prepare for a “no”. If you get a “no”, quickly reiterate your arguments and stand your ground. If you still get a no, immediately request to speak to a manager. No need to waste much time with a useless rep. If they say “sure, but the manager will tell you the same thing”, ignore the rep and request to speak to the manager. Repeat your arguments to the manager. This is where things get intense. Do not take no for an answer and sternly request retribution/reimbursement etc. Still getting a no? Grow a pair and dig-in! Now’s not the time to let up. Remember, there is always someone that can help you, even if the rep and manager say that they can’t. Ask to speak with someone who can help you if the manager won’t. Many companies have separate teams to deal with persistent customers. Reaching them is your end goal if the manager is useless. Stress that they are wasting your time as well as their own and costing the company money by spending so much time with you on the phone. Threaten to cancel your services, if necessary. Use social media as leverage (last resort). Going through this process takes practice but one thing is for sure, you will certainly show weakness if you are not dedicated to getting what you want. If you’re not truly upset, do not follow this process and live with the situation. If you are truly upset, use it! I have a near perfect record in dealing with customer service departments simply because I am persistent, offer coherent arguments, express real pain and ask for specific solutions. The bottom line is, bad customer service has unfortunately become the norm, forcing you to fight for what they deserve. Whatever you do, don’t take no for an answer. Parent’s always want the best for their children; whether it is private school, language immersion or special extracurricular activities. In Canada, for example, French immersion is very common to ensure that children grow up to be bilingual. Being bilingual has many advantages, particularly for countries with multiple primary languages like Canada, but these advantages pale in comparison to the advantages of learning the global language of code. Essays and literature are not translated internationally easily, unlike code. A well-written program or application can be used globally with only small modifications to the interface. More importantly, however, because of the increased prevalence of technology, those that know how to code will find success more readily in today’s world than those that do not. Learning to code should become a priority, and education should begin at a very young age. According to J. Paul Gibson, a computer scientist at the University of Ireland, “Children aged from 5-11 have so much potential for learning about algorithms and computation that it would be a shame to wait until they are teenagers before we teach them the foundations”. Gibson found that older students (18 or 19 years old) struggled to learn the concepts of programming compared to much younger students. This applies to technology-use in general, not just programming. Teach your children how to code and use technology! Gibson’s insights may seem obvious to some — that people learn things easier, and more wholly, as children — but to many it is still frowned upon to introduce children to technology at a young age. There is a delicate balance between allowing your children to learn technology, and allowing them to get lost in it, but you absolutely have to try. I would argue that it is better to have your children “get lost” in technology then for them to never “find it”. Therefore, teach your children how to code and use technology! North America is already falling behind when it comes to producing strong programmers, mathematicians and scientists. Programming, like education in general, is still viewed as “nerdy”, so many students avoid the subject. The reality is that, nerdy or not, the technology sector produces some of the most lucrative careers — much better than flipping burgers for the rest of your life. Of course, parents always have to balance their children’s interaction with technology with other activities like sports, social activities and outdoor fun, but introducing technology and coding to children early is vital to their success in the ever-changing world of technology. Most people probably have understand that hitting the snooze button and wasting their day away is not a very productive practice. What most people do not know, however, is just how bad snoozing actually is. For those that have not yet discovered Lifehacker, I highly recommend taking a look. Lifehacker, as the name implies, is a series of blogs that aim to help you “hack your life” through tips and tricks with your everyday motions. Lifehacker recently posted an article why you should stop hitting the snooze button with a link to a great summary video on the dangers of snoozing. To briefly summarize: snoozing is bad! Perhaps you have already determined this yourself, or perhaps you are about to discover something that will dramatically change your life. I, for one, can admit to the fact that I used to snooze A LOT. What I didn’t realize was how much it was affecting me each day. As it turns out, snoozing can dramatically impact your brain in a very real and chemical way that can reverberate throughout your entire day. 1. I discovered that snoozing was taking a toll on me mentally. On the days that I snoozed several times I was much more tired than the days when I was forced to get up immediately. 2. I was sleeping too much. I had always heard that the magical number for sleep was 8 hours, so I tried to get 8 hours of sleep each night. The problem was that I was still feeling really tired most days — yet on the days that I lost sleep I felt more awake. At the time I attributed this to being “over-tired”. I figured that I felt great because I was simply over-tired, however as I later discovered, I only need 6-7 hours of sleep! I’m sure many of you reading this post have found their optimal sleep duration, but if you feel groggy or “out-of-it” fairly frequently, it may be time to try reducing your sleep (or increasing it if you sleep less than 6 hours). Many people would be surprised to find out that they only need 6 or 7 hours to function at their maximum potential. Take it from me, someone that took forever to come to this conclusion — stop snoozing and experiment with 6 or 7 hours of sleep and see if it has the same profound effect on your as it did me. I am extremely proud to call myself Canadian for hundreds, maybe even thousands of reasons. Just when I thought the list couldn’t get any longer, I am proud to add “we’re epic fundraisers” to the list. As most of you know by now, Movember is all about growing dirty mustaches to raise awareness about men’s cancers and raising money to help abolish cancer in the process. I am happy to say that I have decided to take an active role in Movember this year and am happy to be a part of two awesome teams: Mustache Men B.C. and, much more broadly, Team Canada (currently at the top of the Movember fundraising leaderboards). So far Movember has meant growing a very dirty mustache (patchy because of a hot oil spill on my face when I was younger),and running a Casual-Friday-by-donation. My goal for my first year fundraising is $200 and I am almost there. If you would like to help me reach my goal and say a big “FU” to cancer please visit my donation page. As you can see in the image above, Team Canada is currently the biggest fundraiser in the world with already over $17 million dollars raised to crush men’s cancers! This is particularly impressive seeing as we have raised twice as much as the US despite having a small population. As Canadians we should be proud of our collective efforts and everyone should be proud of a campaign that is already so successful with almost half the month still to go. Team Cancer is taking a bruising thanks to Team Canada! To everyone growing a stash despite the looks they have been receiving from passers-by, I say keep up the good work and don’t worry, it gets fuller! I took part in my first “official run” of my entire life the other day and thought I would share my experience and encourage others to get involved. Runs are so much more than just running – they are about getting out there and meeting people, about supporting great causes, getting exercise and having a ton of fun. There are few activities that are as fulfilling. I don’t want to get too airy-fairy here – I am simply saying that doing a run accomplishes a lot of goals at once and it feels great. I have always enjoyed running but here’s the catch: I have asthma that, while fairly mild, limits my endurance. As a result I have spent my life as a short distance sprinter. Despite not being tall I was always really fast, but when it came to long distance running I truly came up short. I can remember taking part in a number of very short distance Terry Fox runs as a teen and hardly being able to run for 10 minutes at a time. Sprinting served me well as a kid (I was always a champion at tag and track-and-field) but its usefulness fades with age. So I decided that over time I would work on my endurance so that I could focus on running on a consistent basis to stay healthy. A brief stint in the military greatly helped with this goal, as no one pushes you quite as hard as a drill Sergeant; often literally. Before I knew it I had doubled my distance, then tripled it and more. I am still far from my goals today but have come a long way and am proud of my progress. I took a big step recently by making it out for my first organized run. Held at Etienne Brulé Park, towards the west end of Toronto, the event was Halloween themed and appropriately named “Are You Afraid of the Park?”. The run was organized by a group of students for an event-management project and everything seemed to go off without a hitch, so props to them! Marathoners or regular runners may chuckle at the fact that the run was only 5KM, however, prior to learning about the event I considered a “good run” at the gym to be about 2-2.5KM. Doubling my typical workout at the gym seemed like quite the stretch considering I had only about a week’s notice by the time I had decided to partake in the run. My first effort to run 5KM prior to the event failed miserably; I made it to the 3KM mark before stopping, exhausted and unable to continue. The pace I had set for myself was partially to blame. There is a lot of strategy around successfully completing a run (mostly at distances much greater than 5KM) as marathoners surely know. After adjusting my pace, I was able to complete 5KM at the gym in 37 mins. Come run day I was able to take an average of the two paces I had attempted at the gym to be able to complete the 5KM run in just over 20 mins. Not bad for a first try, right? I was surely excited about my progress. What made the race even more satisfying and fun was that there were obstacles along the way, every KM or so. These obstacle-course-runs are becoming more popular and for good reason; they are a ton of fun! Runs are awesome. You will feel amazing, and for a variety of reasons. After this experience I greatly look forward to partaking in more runs in the near future. Whether you are running 1, 5 or 42 kilometers, start with what you are comfortable with, and get out there! You won’t regret it! Feel free to share your own running stories below. Now accepting encouragement. While the screaming “duuhhhh’” is still strong in your mind, I want to take a moment to explain this post. 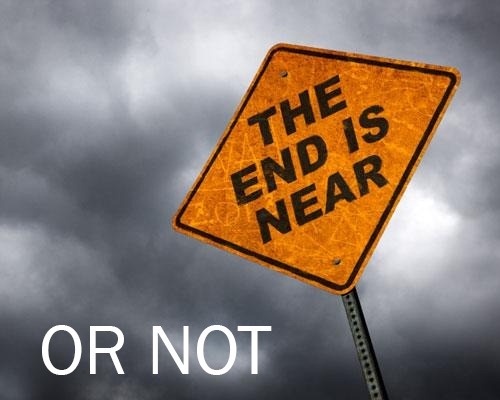 Of course the world is not coming to an end in the near future, and no number of mayan calendars will change that. However, there are many very real threats to the world as we know it. There is less to worry about than the media would have you think, which I will show you with the help of Apocalypse Not. The modern environmentalist movement started as long as 50 years ago with the publishing of Silent Spring. The book focused on the danger of pesticides, as well as other chemicals, and their cancer causing effects. Despite the legitimate danger of many of these pesticides, the overall impact was greatly overstated. Cancer rates have now been falling for over 20 years. More dramatic were the claims in the 1970’s when Life magazine claimed that “in a decade, urban dwellers will have to wear gas masks to survive air pollution”. Impressive innovation, as well as regulation, has allowed us to gradually improve air quality throughout the developed world. Then there was the threat of acid rain, and then thinning ozone layer; each prompting a barrage of media hysteria. Each issue has been addressed over time and are no longer dramatic causes for concern. For decades the media has screamed about various diseases such as swine flu, west nile, SARS and AIDS. With the notable exception of AIDS, each of these diseases were rather short-lived as methods of treating and preventing them were readily implemented. Long gone are the days when a disease can rip through the population and kill millions. Quarantine measures have helped cut off the spread and vaccines are now routine to create. We are even beginning to win the war on AIDS, one of the worst diseases of the last century. New infections are down 20% across the world and 2.5 million lives have been saved since 1995 through antiretroviral treatment. In the past, diseases have been a very real threat globally but are quickly becoming a thing of the past due to impressive medical innovation and global education. The fear of urbanization increasing disease prevalence has also largely been debunked. Many diseases are borne by wildlife and as more people move into cities the chances of diseases carrying have grown smaller. We are, as it seems, our own harshest critics. No other issue has received such attention as the threat we are to ourselves. “Human beings are a disease, a cancer of this planet” said Agent Smith in The Matrix. People do cause a number of problems for the planet and ourselves but perhaps the biggest looming threat is our increasing population. For years it has been said that we will no longer be able to feed everyone in the world. Can you guess what happened? Yes, through scientific innovation and improved farming efficiency, we have been able to squeeze more and more food from smaller and smaller amounts of land. Shrinking family sizes globally has further reduced this problem. In 1977 Jimmy Carter predicted that world oil demand would overtake production by the 1980’s. This media hysteria has persisted since then and is still around today in various forms. New technology would, again, swoop in to allow us to increase oil and gas production consistently in the last 50 years to keep up with demand. In fact, new techniques of shale gas extraction have been so effective that oil supply has now increased dramatically, depressing oil prices (bad news for Alberta as their deficit will likely triple on slumping oil prices). Time and time again, the media has blown the seriousness of global issues out of proportion. We all know they do this, yet even the most resilient of us get lost in the media from time to time. So we should ignore the warnings of the media and impending doom such as global warming, right? Wrong. These issues are all very real and require our undivided attention and collective effort. However, we have to come to be more trusting of our ingenuity. Instead of running around screaming about the end of the world, we should focus on how we can innovate to combat these issues. We have many thousands of years worth of evolutionary victories, there is no reason to think that the next thing to come along will be what does us in. I, for one, have tremendous faith in the human race as a whole.